We went to meet with the dietitian, Kristy Morrell, who is advising me on my food for the trip. She is in charge of monitoring and advising on the diets of all the sports teams at USC. It was good to finally meet her as she has so much knowledge. She's been working on the different menus for each of my approximately 30 weeks on the boat. Mountain House Foods will sponsor some of the long-life foods that I will be bringing. It is super important to have the right foods to keep you going out there. We're talking about all kinds of stresses and how to anticipate them and deal with them. The ship that Wild Eyes is on has been delayed so she is now arriving in Ensenada on Friday. I can't wait to get on her again! Zac and I picked up our new passports today. I finally qualify for a 10 year passport instead of the 5 year kid ones. I am so anxious to get to work on her. There is so much to do back here that its been good to have a little time at home to get details organized like all the various foul weather gear I will be needing for the trip. There are layers, hats, gloves, dry suits, survival suits and boots to be tried on and purchased. I spent an hour in the dental chair today getting a few things sorted out. Don't want a toothache out there! And then, of course, there is Sid Wing, my trainer, who comes by faithfully to torture me with weights and running exercises. I was hoping to take the boat from Ensenada by myself, but there are so many issues with traveling to Mexico and clearing customs that it is better to have my dad along. But as for the sailing part of it, he's just along for the ride! Things have been pretty busy back here. With the departure coming up we've begun to sort out a lot of things like food, clothes, and foul weather gear. Its been a little weird being back home after spending so much time on Wild Eyes and I can't wait till she gets here! Thanks to Brian, back in Fort Lauderdale, we have a computer and navigation software. He was a great help, and it is thanks to people like him that my trip is possible. Also Shoe City has been great throughout all of our preparations and they are the reason that we were able to buy Wild Eyes in the first place. Mountain House dehydrated food has come on board recently and they are working with Kristy Morrell, the sports nutritionist that is helping plan for my nutritional needs en route. I'm working on getting some foul weather gear too. 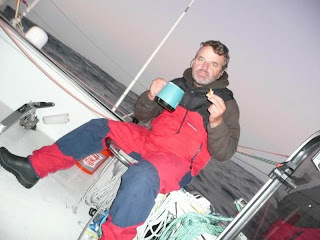 One of my sailing heros, Dawn Riley, gave us some advice as to what to do to keep warm in the Southern Ocean. I'll have one lighter set and then a heavy duty set for down in the Southern Ocean. My ditch bag is just about packed and my medical kit is coming together with the help and guidance of Dr David Lowenberg. Something I hadn't been doing much about up till now is getting together things to do while I'm out there. There are so many other things to do it really seemed unimportant in comparison, but I'm starting to work on getting together some books (can anyone recommend the Kindle? ), getting some new music on my ipod, and getting my school books together. Zac and I were on Good Morning Australia on Monday which was good fun. I have been doing a bit of interviewing and I have to say that it is actually getting a little easier! 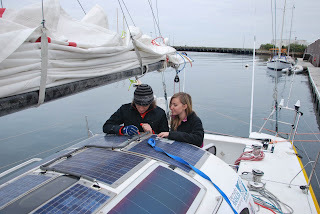 We left Fort Peirce with promises of lighter wind in the afternoon and a plan to hug the coast. It didnt turn out that way. We probably should have waited till the afternoon and checked to see for ourselves whether or not it really was dying down, but it was getting late, and we were begining to worry that we might not be able to make the ship in time. We got towed out by Vessel Assist because the current and waves were too much for Wild Eyes' little engine. We tried to sail but with the conditions being wind on the nose and the Gulf Stream against us we weren't making enough headway. We decided our best bet was to give tacking a shot, but it didnt work out quite as nicley as we had hoped. Now tacking isn't a bad thing and often works fine but we were hardly able to make any head way. we were tacking every 15 to 20 minutes and were going at top 7 knots. We began to realize that we wouldn't be getting much sleep that night. I can safely say that was one of the hardest parts of the entire trip. The night dragged on forever, but eventually it did start to get light out. We were all exhausted and had come only 40 miles. We decided to pull into West Palm Beach. In order to run the auto pilot we had to use the engine for charging. But that had broken down during the night. It turned out we had gone over a lobster pot. The marker on it was a little stick which would have been hard enough to see during the day let alone at night! It had wrapped itself around the strut and shaft and actually broke the strut. We couldn't do anything about it where we were so we would just have to be towed back out when the weather changed. It was great getting to sleep, though I don't remember falling asleep... just waking up at 6 the next morning with Vessel Assist there to tow us out. That day was amazing and a great way to end the trip! We had about 10 knots of wind and were making about 8 knots boat speed. We went just as far as we had the entire day before in only a few hours. The auto pilot had broken, but it was such a nice day out everyone was happy to hand steer. We pulled into Fort Lauderdale Thursday afternoon, still a little tired but pretty happy with how the whole trip had gone. We had been under a lot of pressure to get Wild Eyes to Fort Lauderdale in time to be loaded on the Marie Rickmers for shipment to Ensenada. If we had missed the ship, my trip would have to be postponed. Zac left us that afternoon not too long after we got in. We all (my dad, Mike Smith and I) spent the night in a sma ll hotel room that night, and I was luckily allowed to sleep on the boat for the rest of our stay there. We got a lot of much needed work done. We replaced the solar panels, fixed the strut, got every thing ready so that when she gets dropped off in Ensenada I can hop on and take her right up to Marina del Rey. Dad with his cup of tea . Well, here I am sitting on Wild Eyes in Fort Pierce, Florida waiting for the wind to change direction. 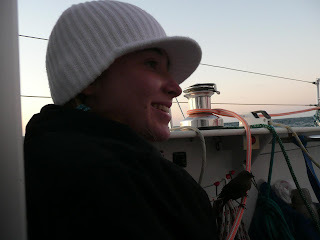 It's been hard on our nose for the past day or two and Wild Eyes doesn't do well close hauled. We got out of Newport, Rhode Island last Sunday, two days later than we had been hoping to leave. Our trip started out nicely with a good bit of wind coming from the north and we were racing along with our full sail up going at about 8 to 9 knots. 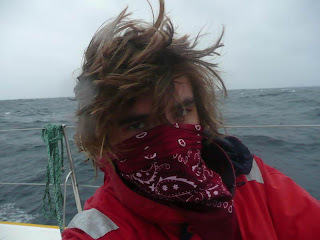 It didn't stay like that for long though, by the next night we had 25 knots of wind and 15 foot breaking seas. It was amazing! And Wild Eyes handled it all great. 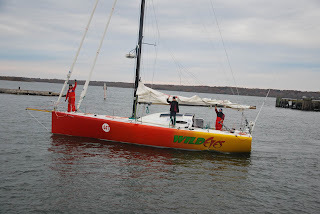 I've come to realize a bit better how much work Wild Eyes will be; she's a great boat, and designed for single-handing, but she is a race boat. It takes more than twice as much work to do anything on her than on any other cruising boat - but its worth some extra work. That rough night on Wild Eyes wasn't at all bad - it was actually kind of fun. We were making great time going at around 15 knots and once getting up to 24kts surfing down a wave. We were down to the third reef in the main and healed right over, though it was nothing compared to what I will get into. I will get a lot of weather like that in the Southern Ocean and it was good to be able to see how the boat handles in that sort of thing. Our auto pilot has done great. When we first left Newport we couldn't get it working so we ended up hooking up the secondary auto pilot and its a miracle she's still working. The boat slides all over the place when surfing down waves and even with all of that extra work she's managed to keep us on track so far. She is very loud, but after the initial fear of having to hand steer for the whole trip we agreed not to complain, lest she feel she wasn't appreciated and break down. Sailing with Zac has been an experience... and I'm still trying to decide whether or not its a good one! He's taken advantage of there being no mirrors on the boat and I very rarely wake up without some drawing on my my face. He also has taken great joy in little things, like my mortification at watching him wash a cup with salt water and a dirty sock. But despite how annoying he is, its really good to have him with us out here. I could write a whole lot more about this trip, but I have to get going, we have a few things to finish up before we pull out. Many thanks to Trond Hjerto from the sailing vessel Maryam for the above photos of the crew! Last contact had them all in good spirits, warming up as the head further and further south. Winds had been light at times except for a day of stormy 20-25 knot winds a few days out. They should have a steady 20 knots to blow them into Fort Lauderdale in the next day or so. It must be strange for Laurence to sail with two kids who can run the show! A special thanks to Leedy Ying from Shoe City, Inc, without whom this boat and trip would not be possible. Look out for a new web site soon with lots of fun and interesting links ect. Abby had an incredibly friendly and encouraging email from Australia's Jessica Watson, who is already out there sailing around the world. She is looking forward to getting to port and getting in touch with her. Abby and Jessica have both dreamed of doing a trip like this for years - I'm sure they will lots in common! Check back in a day or two for an update from Abby.